Finding duplicate photo files is a challenging task that shouldn’t be performed manually. Instead, it is recommended to use cleaner software with pro features allowing to quickly detect similar and duplicate images that consume precious hard drive space. The suggestion is grounded in the fact that the cost of using the multi-shot mode is the existence of a large number of photos that, despite not being pixel-by-pixel identical, are still extremely similar. For this reason, Mac owners can benefit from installing free and paid utilities for sorting and deleting picture copies. WebMinds Duplicate Photo Cleaner Pro and PhotoSweeper X by Overmacs are powerful tools for organizing photo libraries. Just pay a fair and reasonable price for either lite or pro versions of the utilities, which you can quickly download from the official websites and forget about ever looking for photo cleaner alternatives. The review has been written to help those Mac users who don’t want to use trial versions of WebMinds Duplicate Photo Cleaner Pro and PhotoSweeper to discover their requirements, price, benefits, and limitations. The article also provides an easy-to-follow manual for setting up and using the photo cleaners. Let’s start! Duplicate Photo Cleaner Pro is a swift photo duplicate finder for Mac, which works for the most popular picture file types. That’s being said, it is necessary to stress that in addition to easily recognizing identical photos, the utility has been designed to help users trim down their scattered albums in one push of a button. But wait, there’s more: if after deleting a bunch of look-alike landscapes you realize that you need to keep them, simply click the Undo button to restore them. PhotoSweeper 3 provides another simple method of detecting and eradicating both identical and similarly-looking pictures from a computer. Forget about a clattered photo library, which contains hundreds of duplicate pictures with this neat application. The scanning abilities of PhotoSweeper will help you to free up multiple gigabytes on your hard drive, thereby leaving more space for bulky photo editing software that is much-needed for any photographer. 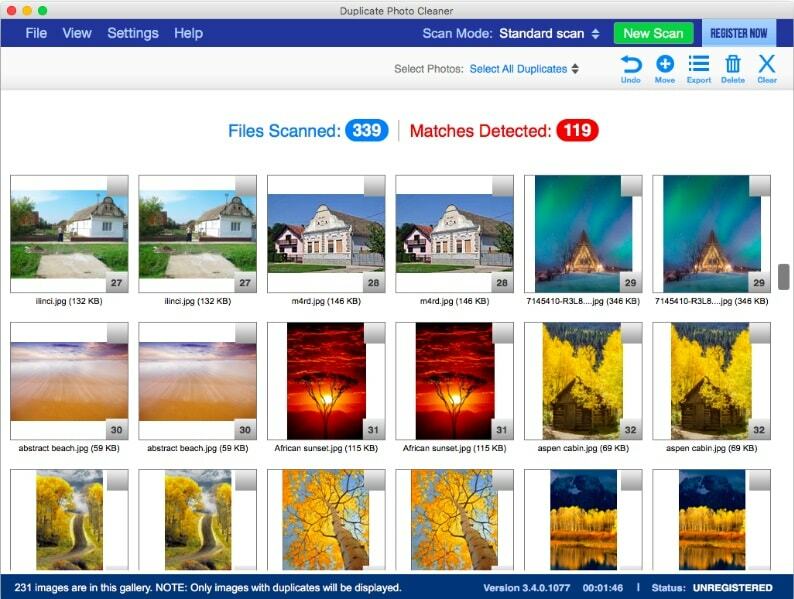 Duplicate Photo Cleaner Pro has a few nifty tricks under its hood. It goes without saying that the utility uses a powerful scanning algorithm to detect duplicate pictures even in remote directories. What is interesting is that the scanning function of the app can function in the following modes: standard scan, sector detail scan, photos scan, and folder comparison. The use of these modes helps a user to customize their photo search, thereby saving them a fair share of time and effort. Another feature supported by Duplicate Photo Cleaner Pro is exporting, which can be used to save scans to TXT, CSV or HTML files. Furthermore, users can tweak the ignore list, thereby omitting from the scan images that have been cropped or resized. By setting the similarity threshold, it is possible to search for pictures with pre-established resemblance percentages. The cost of using these advanced instruments of the utility is $39.95. Not unlike Duplicate Photo Cleaner Pro, PhotoSweeper can be effectively used to trim down the photo library of a Mac. However, this utility has a much sleeker interface and a wider variety of tools and user preferences. 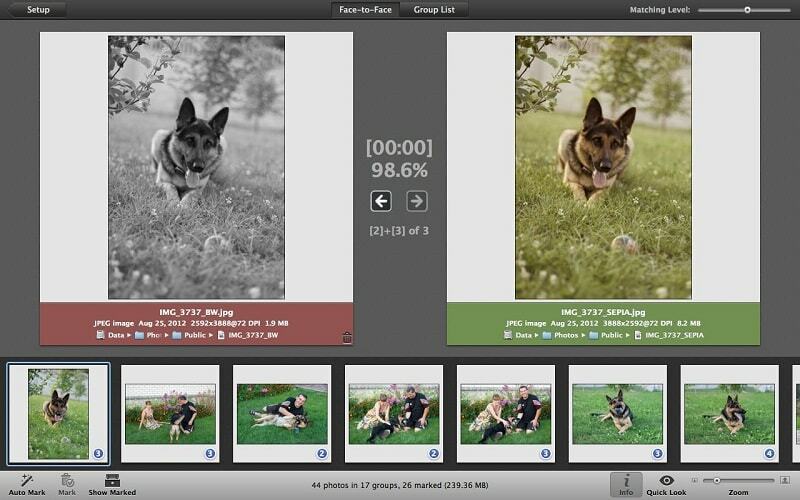 Specifically, PhotoSweeper has intuitively adjustable photo grouping capabilities, which help to determine a time gap between series of shots. 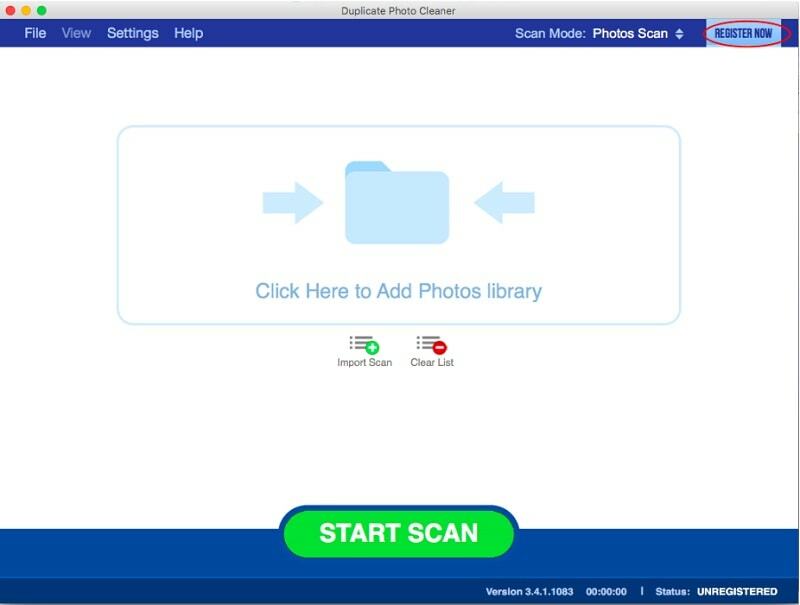 Furthermore, the utility uses an auto-lock function to keep previously scanned photos from being marked for removal. Unlike its counterpart, PhotoSweeper can be used for scanning video files, which can be quite weighty. 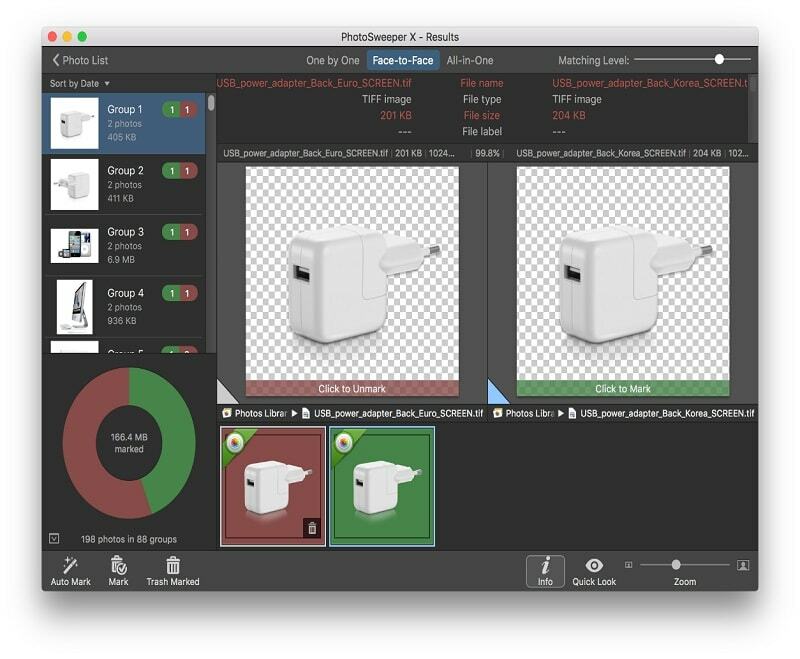 The up-to-date editor helps to change image dimensions, size, and color saturation among others, thereby obviating the need for dedicated software. And if that was not enough, the utility allows renaming pictures in bulk. That’s being said, the duplicate cleaner costs meager $9.99. How to Use Photo Duplicate Cleaners? Enter the registration details and click on the Activate button to activate the user license. Click on the Compare button and select one out of three comparison modes: similar photos, time gap, and matching level. Use the Trash Marked button to remove similar or identical photos. Even a cursory glance at the interfaces of the two apps is sufficient to determine that PhotoSweeper has a much simpler and modern interface than that of Duplicate Photo Cleaner Pro. As for the usability, info panel, photo preview feature, and color labels of PhotoSweeper make the user experience considerably richer. There’s no doubt that the developers of Duplicate Photo Cleaner Pro should review its usability strategy to improve deep navigation and potentially confusing content. When it comes to the performance of Duplicate Photo Cleaner 4, it can be argued that the accuracy of visual similarity detection is up to snuff. The app can be effectively used to collect information about existing photos and remove duplicates in a safe manner. It never crashes and works exactly as advertised. However, the grayscale detection of the cleaner for iPhoto is not working as was expected from the high-end application. At the risk of pointing out the obvious, PhotoSweeper 3 is the much better choice for managing Mac Photos Library. The software does a fantastic job of letting the user comb through their picture folders and delete photos that have been taken in quick succession and are not needed by users. Photo Sweeper is an incredibly fast and efficient application that can become a veritable bugaboo for identical photos in folders. If after using other applications, you still have duplicates, it’s a sure sign that it’s time to install PhotoSweeper 3. What is worth adding in this review is the list of features that the photo cleaners have in their grab bags of tricks. Photo editing tool helps to change image dimensions, size, and color saturation among others. Image info provides users of the app with additional data such as modification date, resolution, and size among others. The comparison of pros and cons of Duplicate Photo Cleaner and PhotoSweeper reveals that the latter app is the best choice for those Mac users who require fast and accurate duplicate photo detection in the reasonable price range. In addition to being cheaper than Duplicate Photo Cleaner, PhotoSweeper has more extensive functionality, which makes it a go-to tool for all Mac owners. In terms of ratings, Duplicate Photo Cleaner scores at 7.1/10, whereas PhotoSweeper approaches whopping 9.5/10.